Repair, parts and refurbish most engines. Specializing in "MUSCLE CAR ENGINES"
best start as low as $299.95. 34 years as a tire dealer. 17years in North Hills and the Laurel Gardens area. 52 years as a resident of North Hills. We do only tires NO service work done. We stock the following trusted brands: Bridgestone, Firestone, Dayton, Michelin, Goodyear, BFGoodrich, Dunlop, Republic, Uniroyal, Cooper, Hankook, Multi-Mile, Hercules, Toyo or Kumho. We specialize in tire repair, tire replacement, wheel balancing, and manage government and national accounts for Bridgestone and Goodyear. Tire Pressure Monitoring System - Custom Wheels - Tractor tires. Member of The Western PA Tire Dealers. Our staff of 18 local area employees have the knowledge and experience to service all of your tire needs. 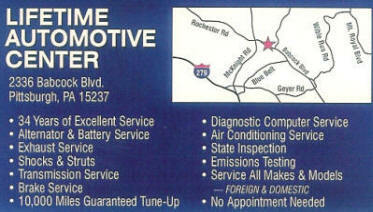 Laurel Gardens Tire Service is proud of being family owned. If your need tires and service from a local mom and pop business your will not be disappointed. Used Cars, Trucks & Vans. Hours: 8 - 5 Mon. - Fri.